Director Neill Blomkamp’s latest film Chappie is engaging and emotive as it evokes other movies about robots like WALL-E.
Chappie is based on Blomkamp’s 2004 short film Tetra Vaal and stars Sharlto Copley, who voices the eponymous character and does motion capture for Chappie as well. It takes place in Johannesburg in the near future and robots have replaced humans as the city’s police force. 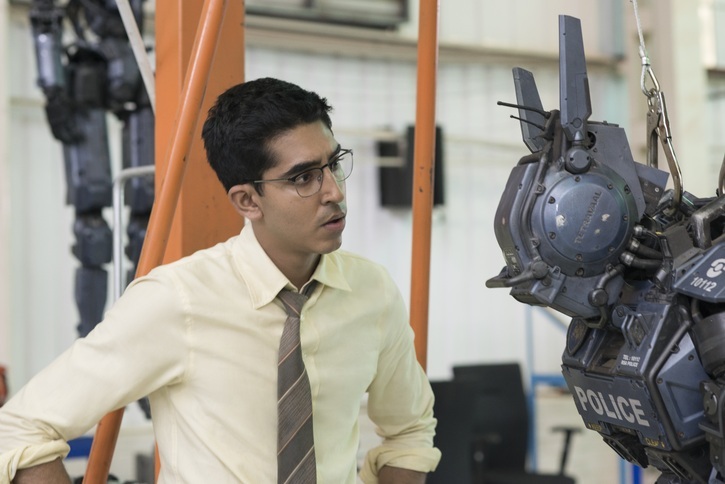 These humanoid robots are built by a weapons company and are the brainchild of Deon Wilson (Dev Patel), a young genius engineer who is trying to create a true artificial intelligence. His success rubs his engineering rival, Vincent Moore (Hugh Jackman), the wrong way. That is because Moore’s own robotic enforcer, the MOOSE, has been rejected by the company’s CEO (Sigourney Weaver), since the Wilson-designed robots are highly effective. Despite his success, Wilson is unable to get approval to develop his AI program and he decides to continue working independently using a deactivated robot that is due for the scrap heap. Concurrent to this storyline, the film showcases the downtrodden lives of a trio of gangsters (Yo-Landi Visser, Watkin Tudor Jones and José Pablo Cantillo), who have to pull off high-paying heists to pay off their debts. They concoct a plan to kidnap Wilson so they can get him a way to deactivate the robotic police force, thus clearing their ability to rob and steal. When they do kidnap Wilson in his van, his vehicle happens to carry the discarded robot and the AI software. In their lair and under the threat of his life, Wilson downloads the program to the robot who is reactivated. At first, the robot displays an innocent and timid child-like demeanor. Showing signs of sentience, Chappie (as he is named by Yolandi, the gangster that he considers his “mommy”) starts learning about the world and bonding with the thugs and Wilson. Unfortunately, Chappie is subjected to cruelty by the head gangster, Ninja (Jones), who only sees him as way to garner money. Insisting he is Chappie’s father, Ninja begins imprinting a gangster ethic into Chappie and before long the robot is bopping along , swearing like a mechanical ghetto thug and committing crimes. Yet, the emotional Chappie develops a sense of morality thanks to Wilson, who he dubs “the Maker”. This helps endear him to his human compatriots and allows him deal with the vicious nature of the gangster world and later Moore. That is because as Chappie undergoes his life lessons, Moore devises a sinister plot to discredit the robotic police and promote his MOOSE. Eventually, both plots collide as Chappie handles the unpleasant nature of humanity. Watching Chappie is at times a disheartening experience. That is because Chappie is clearly a child, he delights in reading children’s books and art, yet he is thrust into a nasty environment. Imagine WALL-E or Number Five from Short Circuit having to deal with the criminals from The Wire, who think nothing about attacking him without remorse and engaging in criminal behavior. Chappie is essentially corrupted and manipulated by these criminals that generate little empathy with viewers. They’re largely heartless and cruel, except for Yolandi, who bonds with the robot and considers Chappie to be a surrogate son. It’s hard to feel any kinship with these unrepentant characters, which adds to the empathy for Chappie. In a way, Chappie is a metaphor for gangster youth. All children are born innocent, but some become tainted by their environment and commit criminal acts. This is what happens with Chappie, only we the audiences feel more sympathy towards this robot than with a normal human juvenile delinquent. But despite these hardships, Chappie is able to grow, learn and most of all show a profound, curious nature that questions the nature of humanity, hatred, family and mortality. For that reason, Chappie is less predictable than other films about robots and androids who gain sentience. He isn’t nurtured by his creator and on the run from evil military types who want to use him as a weapon or destroy him. The twist is that Chappie’s moral being has been distorted by bad influences, but he doesn’t become the Terminator. Chappie isn’t evil, just naive and easily misled and he does have redeeming qualities such as his love for “Mommy” and “the Maker”, and a sense of forgiveness. He is a gentle soul and it breaks one heart to see him stuck in a vicious, unkind environment. That is why he is someone to root for, especially in the last part of the film when he faces off against the MOOSE, who is like a bigger, better armed version of ED-209. After faltering with Elysium, Blomkamp has bounced back with Chappie. It’s not as good as District 9 because of some plot holes, namely the lacking security in the weapons factory that allows Wilson and Moore to carry out their schemes. Another fault is the editing that allowed some characters to disappear for long stretches. Finally, the gangsters are so unpleasant that it’s difficult to care about them and they’re the primary characters along with Chappie. 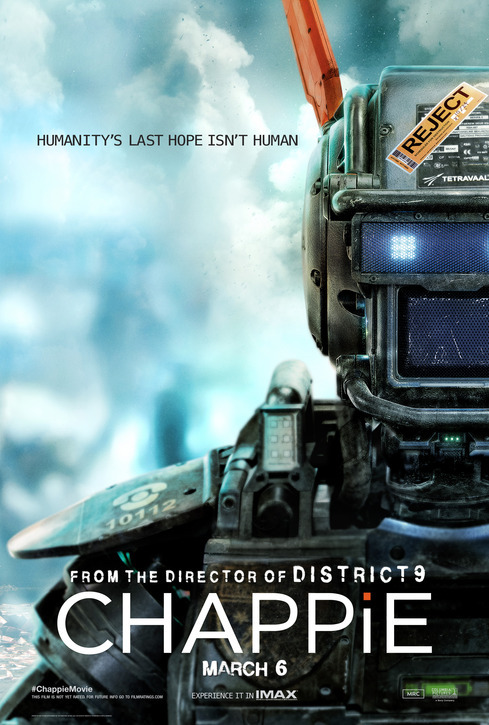 Nonetheless, Chappie is still a solid addition to his filmography.